Have $60 million to spend on a Central Park-facing condo? Two units at One57 are going to be battling for your attention. Extell Development just listed a 6,200-square-foot sponsor unit at 157 57th Street for $58.5 million, or $9,400 per square foot. It is now the most expensive sponsor unit listed at the building, and the move comes as owners in the tower are putting their own units on the market. The apartment is a four bedroom, four-and-a-half bathroom unit on the 87th floor of the luxury tower. It is accessible via three private keyed elevators. The building’s ultra-luxe amenities include a performance room with Steinway piano that overlooks Carnegie Hall, a library room with a 24-foot aquarium, a swimming pool with an underwater soundtrack and a pet wash room. Kyle Blackmon of Compass has the listing. Previously, the most expensive sponsor unit listed at the building was a $28.5 million five-bedroom apartment on the 41st floor. It was listed in March, 2018 by Nestseekers International and has not yet sold. This new $58.5 million sponsor unit listing will add extra competition to sellers offering resales at the building. 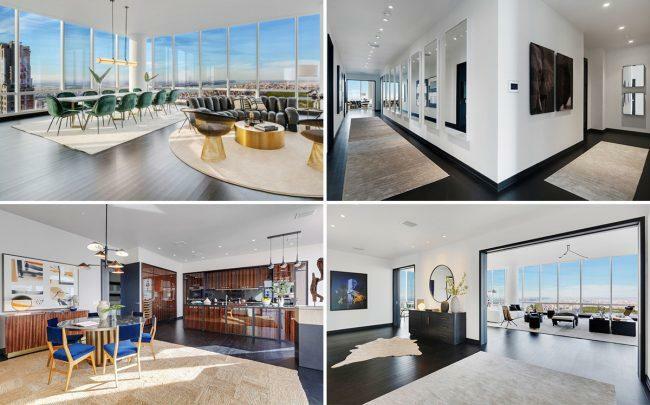 An apartment of the same size on the 80th floor, listed in March by the estate of late Brazilian billionaire Edson de Godoy Bueno, is asking $60 million. Several other high-priced units in the building have sold at a discount from the original listing price. In May 2018, Canadian billionaire Lawrence Stroll sold his apartment for $54 million, less than the $55.6 million he paid four years earlier. Another anonymous investor paid $32 million for 32nd floor apartment that resold for $21.4 million. All sales at One57 face competition from new product that has entered the market, including 520 Park, 111 West 57th Street and Extell’s own Central Park Tower, the most expensive condo project in city history.